This quiet, affordable little guitar-shape air purifier plugs into your lighter/accessory outlet and safely produces ozone to effectively remove smoke odors. It's been road tested by our staff and it really works! 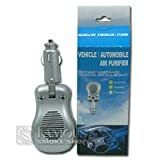 Used with your car's air conditioner, you get even better results. Good gift idea!